The full-moon day of the month of Aswina is called Kumara Purnima, or more commonly, Kuanra Punei. Young girls pray for a husband as handsome and virile as Kumara (Kartikeya) and sing songs to the moon with a special chanda bhoga. Elderly women begin the kartika brata and take to a simple vegetarian ‘habisa’ diet for the next month. Here are three short legends on the day. 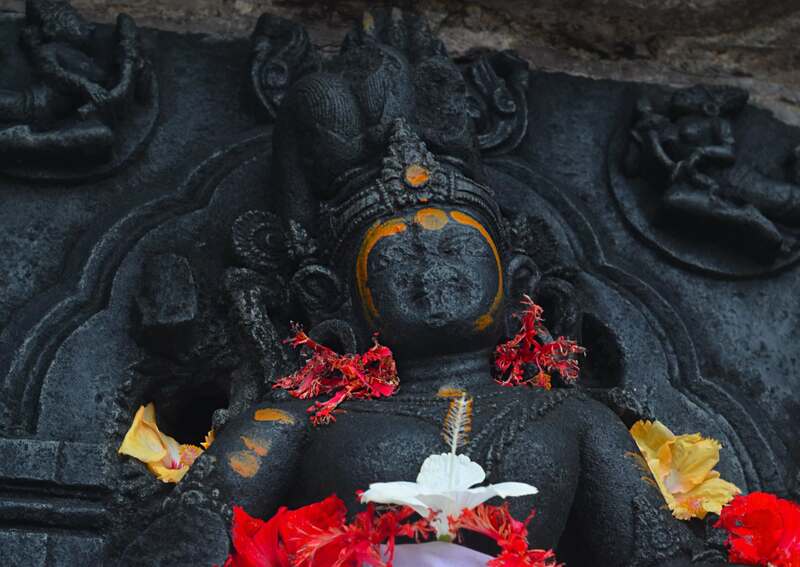 Kartikeya from 13th-century Buddhanatha temple, Garedipanchana. Once the bada panda of Jagannatha worshipped and satisfied him. Pleased, Jagannatha asked him for a wish. The bada panda asked the god to accept his daughter Rai as his consort. Jagannatha had to fulfil the wish, since he had already given his word. He sensed Rai had been born as a part of Lakshmi and it was by fate that she would marry him. When Rai was expecting a baby, she went to her dear husband to spend some time. Jagannatha asked “What food do you crave?” and she instinctively uttered “I wish I could have a delicious muga gaja while receiving worship along with you by the sea.” Amused, Jagannatha told her that Lakshmi wouldn’t leave him. So Rai had to convince Lakshmi first, and this she did by offering her prayers. She tricked Lakshmi into granting her a boon which said she would let Jagannatha stay with her for a month. “Five days less than a month”, Lakshmi added. And so every year for 25 days, Jagannatha is dressed in the Rai-Damodara or Radha-Damodara Besa. This attire consists of wonderful clothes, elegant jewellery and fragrant floral ornaments. Exactly on the 26th day, Jagannatha is dressed in the Lakshmi-Narayana Besa, perhaps as an assertion of the fact that Lakshmi is back in control. Taluchha Narayana Mahapatra, one of the servitors in the Puri Temple once completed his task and took the nakuasi, a floral nose-ornament of the deity to gift it to his beloved, the debadasi Labanyabati. Back home he lovingly hung it in her chignon. However, unknown to him, Gajapati Prataparudra Deba had announced that he would visit the temple in a while. It was a custom for the king to receive the nakuasi as a souvenir every time he visited the temple. By the time Taluchha received this news, the king had already marched into the sanctum sanctorum. He rushed back to the shrine, taking the nakuasi with him. When the king received the ornament, he found a hair in it. Enraged, he concluded that the servitors weren’t carrying out their tasks sincerely and threatened to throw them out. Shocked, Taluchha made up an excuse – this strand of hair was from Jagannatha’s head and the servitors would take no blame. Since then an extra offering is made during the Radha Damodara Besa. On the night of Kuanra Punei, Lakshmi walks through the streets. She calls out “Who is awake?”. Those who answer her question are the ones whom she grants prosperity. And that is why in Odisha, people play pasaa, the game of dice to pass that night. In the Puri Temple, Lakshmi and Jagannatha play the game together. In seven throws of dice Lakshmi wins over her husband, successively seizing his crown, earrings, necklace, belt, rings, sandals and finally him. For seven days a small image of the god remains in Lakshmi’s temple, having lost himself in the game of dice. On the eight day he is left free again.